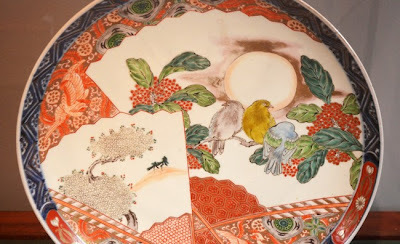 There are so many wondrous and wonderful things about Oglethorpe University Museum of Art's current exhibition "Jiki to Hanga: Japanese Porcelain and Prints", and one not so great thing. Let me start with the one thing. Unfortunately, the exhibition finishes a week from today, which means I'm not going to have time to see it again, but...that also means YOU have a whole week to get there! As much as you've heard me warn against procrastination in seeing exhibitions—because we all know what happens when we wait too long—I almost missed this one. And yes, I knew about it from the beginning—shame on me. The great news is that it's phenomenal! 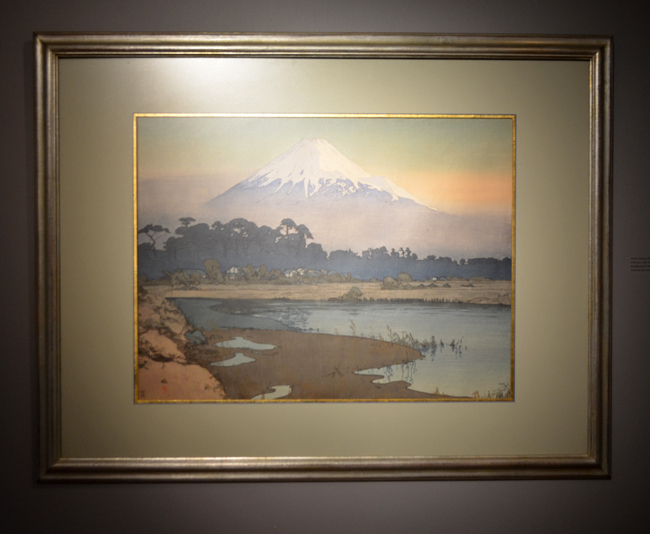 In keeping with the Museum's historical caliber of exhibitions, "Jiki to Hanga: Japanese Porcelain and Prints" is exceptional. 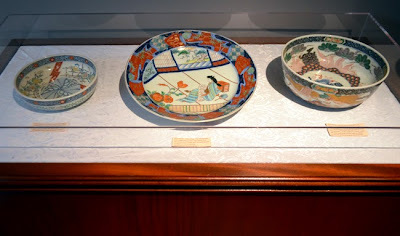 On display are porcelain and prints ranging from the Museum's permanent collection to numerous pieces from the personal collection of Dr. and Mrs. Terry Taylor...no relation, by the way. Of all the prints in the exhibition, "Misty Day in Nikko", Hiroshi Yoshida, (1937) pictured above, is my personal favorite. It reminded me of a day exploring Muir Woods with one of my dearest friends. 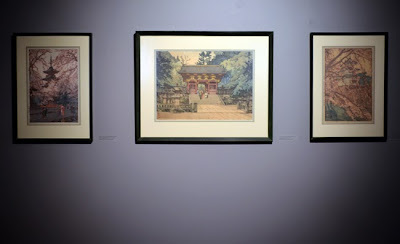 This trio I especially liked because of the cherry blossoms, which reminded me of the National Cherry Blossom Festival in Washington, D.C.—a festival that celebrates the gift from Tokyo of 3,000 cherry trees to the District of Columbia. I attended that Festival for each of the nine years I lived there. The cherry tree-lined Tidal Basin is a spectacle that's offers indelible memories. 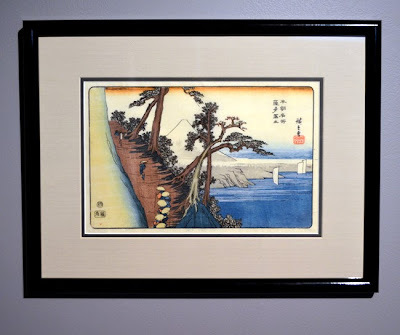 This one, "Fuji from Satta Pass, Honcho Meisho" (Famous Places of Our Country Series) by Utagawa Hiroshige (c. 1930) is another favorite. I'm not sure which it reminds me of more, viewing the Golden Gate Bridge from a hillside or soaking in the Grand Tetons from Lake Fremont, near where I graduated high school. 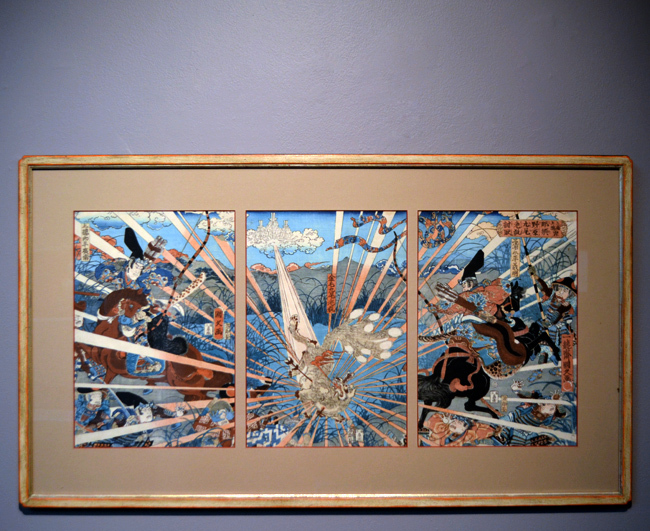 The power to transport the imagination, evidently inherent in this exhibition, is remarkable. I've long been fascinated with Japanese art—as are many Westerners. The more I learn about Western fascination with Japanese art (there's a section in the exhibit catalog about just that) and Japanese fascination with Western culture, the more the whole thing fascinates me! 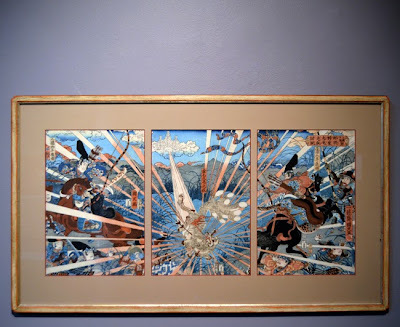 The above piece, "Triptych: Kinmokubiro (The Old Golden Hair Nail-Tailed Wicked Tamamo-no-Mae [fox])" (1859), by Utagawa Kunihisa, more than some of the others, is all about storytelling...I would love to know the story behind it! The exhibition "features 49 color woodcuts and more than 30 porcelain and earthenware objects. 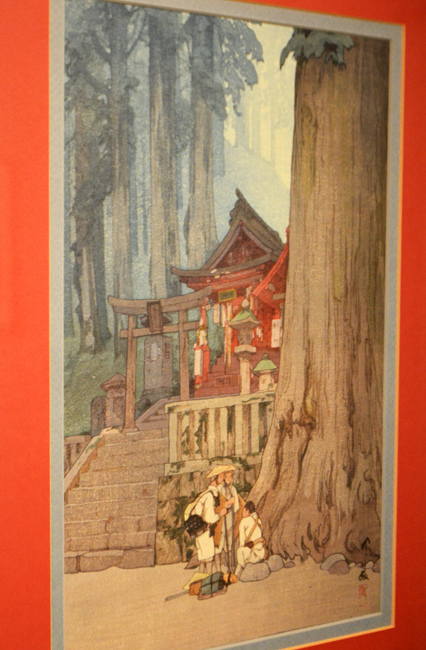 Twenty-eight of the woodcuts are by shin-hanga style master printmaker Hiroshi Yoshida (1876-1950)." 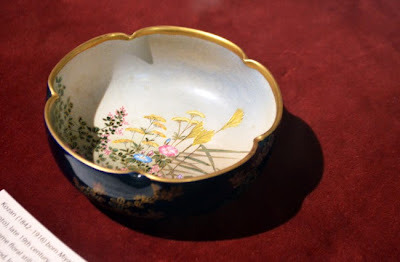 From among the porcelains, this 19th Century five-lobed bowl is my favorite. All of the porcelains are stunning and/or remarkable, but I was totally drawn to this Kozan piece. I've always had a preference for an 'elegant, yet simple' aesthetic and I think this is approaching that. When you go, be sure you examine the detail in the various pieces, especially this 18th Century blue and white Kutani plate. The molded mon rim was a great little surprise, as were many of the details discovered throughout the exhibition. Where the prints took me to other times and places, the porcelains took me directly to the artists' workshops...fully wondering what they must have been thinking, remembering, wanting to convey as they created. This detail of this Brocade Imari charger, from the Meiji period, is absolutely stunning. You're going to want to plan time to truly explore...in this relatively modest size museum, there's a LOT to see. 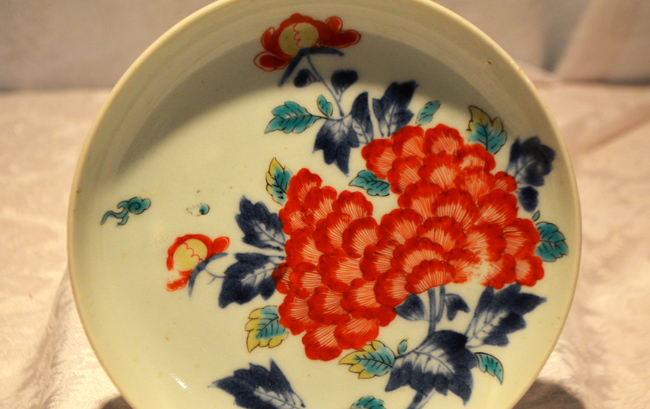 The crown jewel in the "Jiki to Hanga: Japanese Porcelain and Prints" exhibit is this late 17th Century Kakiemon type Arita plate with a spray of peony, which is also on the cover of the exhibition catalog. It's a beautiful piece and you certainly wouldn't want to miss it. So, like I said, you have only a week left to see this amazing exhibition. 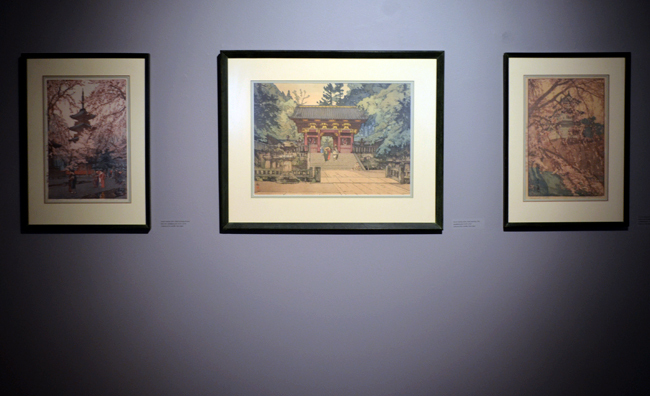 Make your way to the Oglethorpe University Museum of Art and also ask about their upcoming exhibitions. From what I'm told, you'll definitely want to see them!